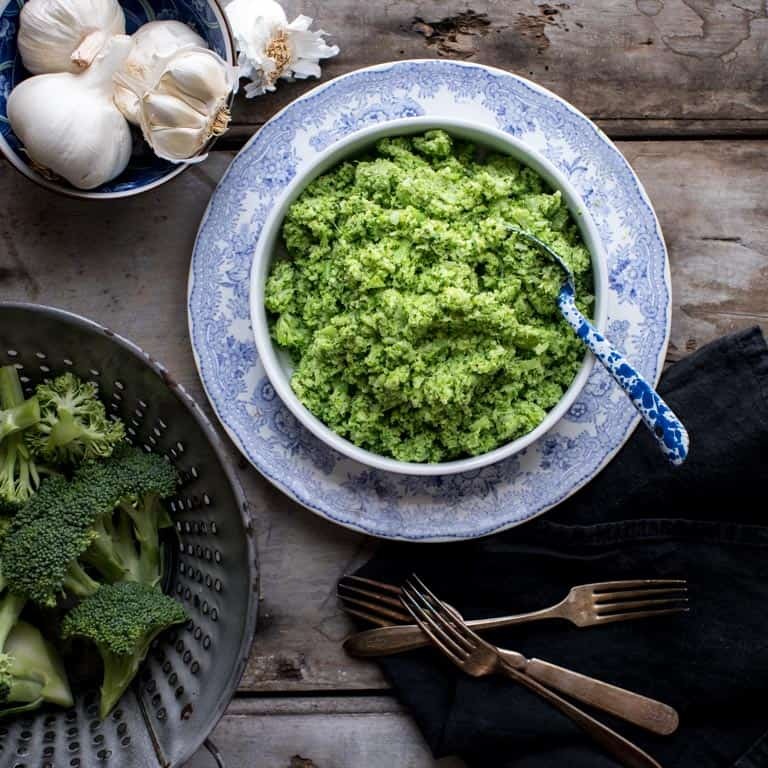 This garlic mashed broccoli isn’t going to win any beauty contests, but close your eyes and take a bite. I promise, it is worth the leap of faith. It is a wow moment! It is vegan, paleo, whole-30 approved, low-carb and gluten-free. Jase and my girls all had pretty much the same response when I served this garlic mashed broccoli to them the first time. “What is this?” Admittedly, it’s pretty unrecognizable. And you’ know, its green mashed stuff- like what the mom on Better Off Dead would’ve served. Okay maybe not that bad. But then one taste, and all three of them were like Wow! Yum! I have to say, that’s pretty much what I said when I tasted it too. I was like I can’t believe it worked! 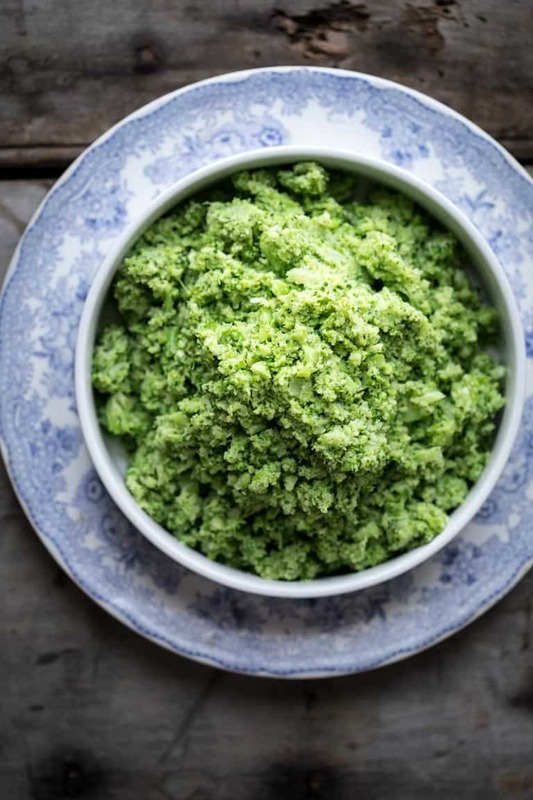 I got the idea for this Garlic Mashed Broccoli when I went out to dinner at a restaurant in the Meatpacking District called High Street on Hudson. My eleven year old ordered the steak and broccoli. The menu cryptically referred to it as “Bernie’s” broccoli. Talk about a wow moment. I really loved what I ordered- but the broccoli was so good, I had major food envy! I apologized in advance to my husband for being so embarrassingly like my dad and proceed to make my way to the back of the restaurant and proceeded to buttinski right into the open kitchen to enquire how the heck they made the broccoli. Anyway, so I decided to make a mashed broccoli recipe here, no canned soup- don’t worry- that was totally stripped down to the basics so that it would be still Wow but without the hours of prep. The solution was shockingly simple actually, and I think when you taste it, you’ll agree. Start with 8 cups of chopped broccoli. It’s fine to use the stems- because it all gets chopped. The texture is best however if you use crowns or peel the stem if it is woody. Cut the broccoli into bite sized pieces. You are doing that so they will cook evenly and relatively quickly. And this also helps them get moving in the food processor. They don’t have to be perfect, so literally chop- no need to make beautiful mini-trees. Save that effort for this lemon garlic broccoli recipe. Steam the broccoli over boiling water in a steamer basket. 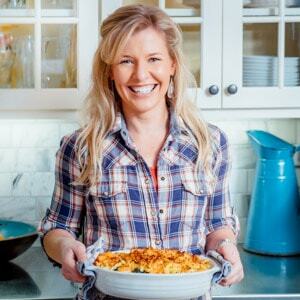 I use an oxo steamer and it is among the most used pieces of kitchen equipment. 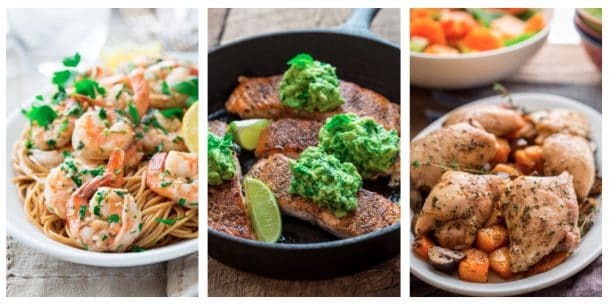 Steaming is healthier than boiling because more of the nutrients are retained. The broccoli will also be less watery when it is steamed. Test if it is tender by spearing it with a fork. You want it to be very soft- but not to the point that the green becomes less vibrant. The taste will be best if it isn’t overcooked. To cook the garlic, sizzle it in a skillet of olive oil. The chef at High Street on Hudson told me they used roasted garlic oil (which in my restaurant days- and for the years following when I was a personal chef- I considered an unsung mother sauce. To learn how to make roasted garlic oil you can read this post.) I found that this simplified step worked just fine- if not as complex- but the key is to really watch it. You want the garlic to take on the barest amount of color- but not brown to the point where it starts to burn or become bitter at all. Then to stop the cooking, immediately add in veggie stock. This can cause splattering, so be careful! Then puree half of the steamed broccoli with the garlic mixture and seasoning to let it get really smooth. Then chop up the second half of the broccoli, to control how much chunk is left in the broccoli. I like a bit more chunk but I know others prefer a smoother texture. I’ll leave it to you to decide. 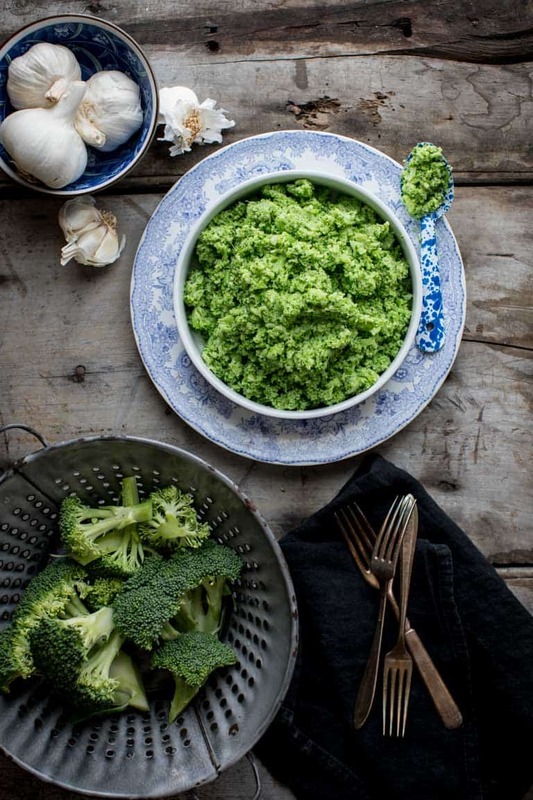 An inspired yet simple way to make broccoli. Steam it until it is very tender, then puree with sautéed garlic and seasonings. It is naturally low-carb, gluten-free and vegan. Serve it with chicken, beef or tofu. Bring 1 to 2 inches water to a boil in a large saucepan fitted with a steamer basket. Add broccoli and steam until soft but still bright green, 5 to 6 minutes. Remove the steamer basket from the pot, pour out water. Meanwhile, place oil and garlic in a small skillet and set over medium high (do not preheat oil.) Cook, swirling the pan or stirring often, until the garlic is starting to brown, 2 to 3 minutes. Remove from the heat and carefully add chicken stock to prevent the garlic from burning. Place half of the broccoli in a food processor fitted with the steel blade attachment. Add the garlic mixture, salt, thyme and white pepper and puree until as smooth as possible. Add the broccoli to the empty saucepan. Place the remaining broccoli in the food processor and pulse until desired degree of chunkiness. Add the chunky broccoli to the pureed broccoli, and stir to combine. Serve hot. 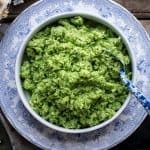 Your broccoli mash looks fantastic. I have never thought of mashing broccoli, not sure why I hadn’t tried this before. Love the addition of thyme here. It must be so flavorful with the garlic added. Thanks so much Helene. Now that we’ve had it, it’ll be in regular rotation. The whole family loved it! Such a beautiful way to prepare broccoli! I just love that color. I’m sure this would be a hit with my family. Yum! Thanks so much Tara. The color really stays nice and bright doesn’t it? This is such a genius change up to broccoli! Thank you very much Amanda. Have a great weekend. This is stunning, and you’ve plated it so beautifully. I love discovering great new dishes in restaurants, but I’m usually too shy to go ‘backstage’ to see how it’s done, good for you! Thanks Susan. I don’t do that very often. But it was an open kitchen, and the restaurant had cleared out for the evening, so I just went for it. The chef was so nice and I think happy to have such a happy customer. I’m glad I did it even if his technique did end up being too complicated to replicate at home. This sounds lovely, I love the flavour of broccoli! 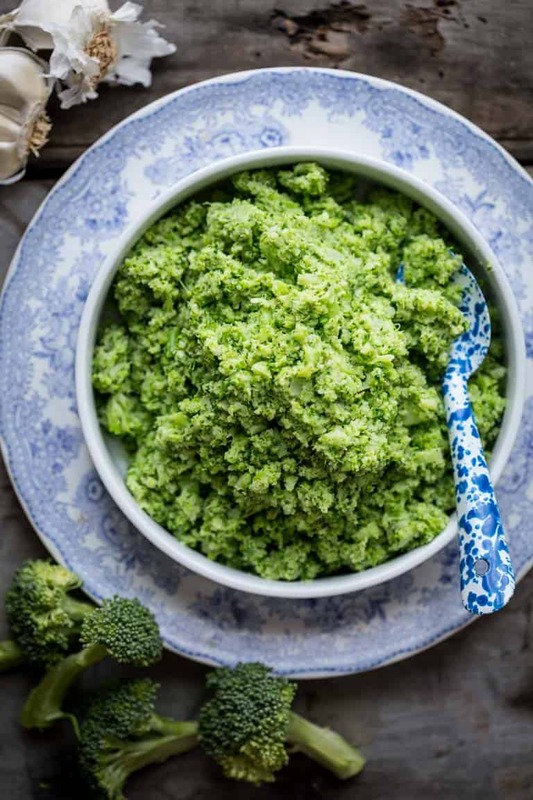 Broccoli is my favorite veggie but I’ve never had it mashed so I’ll have to give this recipe a try- sounds simple but delicious! Such an interesting recipe! I wouldn’t have thought to make broccoli in this way – it looks great! Maybe Bernie will start a new trend with her idea. I fell in love with it. What a great way to get more veggies in! The flavor in here sounds amazing! Hey girl! Thanks so much for coming by. And I am glad to hear you think this recipe sounds good. I am glad people can see beyond the fact that it’s a mashed green thing. Ha ha. Like green beans, broccoli loves garlic too. This looks very inviting! I totally agree about green beans and garlic too. They are a great match. Thanks so much for dropping by today Angie. Have a great week. Never in my life would I have thought to mash broccoli. You’re just genius! Well- thank you for the compliment, but I think Bernie was the real genius! Ha ha. Have a great day Anne. oooh never thought to prepare broccoli like this – pinning and making! You’ve totally convinced me to make this! Both my kids are “sometimes” broccoli eaters, so hopefully they’ll be convinced too 🙂 Looks 100% yummy to me! Thank you Jessy! Have a great week. This has to be the most gorgeous photos of broccoli I’ve ever seen. I’ve made mashed broccoli and I looove it! I love broccoli and what a great alternative way to prepare it! Such a great healthy side dish! Love all the garlic!